We at PATEL GAS PLANTS offers consultancy, designing, manufacturing and project implementation for various projects in Oil, Gas & Cryogenic and Non-Cryogenic Industry across the globe. We serve customers in oil & gas, industrial, technology, energy, and healthcare markets worldwide with a unique portfolio of engineering projects, products, services and solutions, for utility segment of the industry. Business and Technical Innovation continue to be the engine by which we provide value and competitive advantage to our customers. With our new and innovative designs, we have led to build superior equipment providing customers with safe, cost-effective and reliable long-term customized solutions. 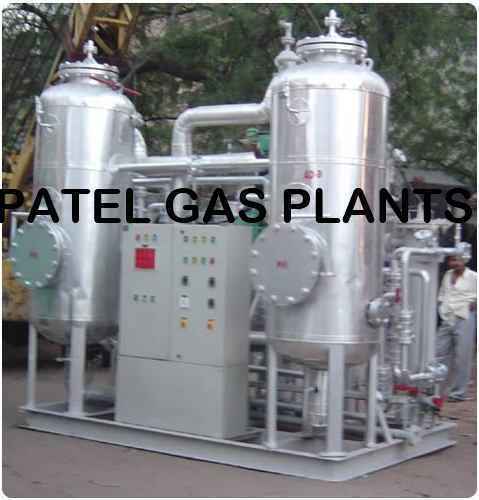 PATEL GAS PLANTS main stream offering proposes customized non-cryogenic equipment to produce various industrial gases and gas mixtures 'on-site' and 'on-demand' either on sale, rented or on built-own-operate basis. This on-site concept not only reduces the operational costs many folds, but also has added advantages of consistent purities, exclusion of external variables, reduced handling and distribution costs, etc. The concept of piping the gas directly from the generator to the point of use, and exclusively for the purpose has been proved sound, technically solvable and commercially viable. In Various industries we supply Process Filters, Compressed Air Filters, Breathing Air Filtration System, Dew Point Analyzer and Moisture Transmitter, Nitrogen Rotameter, Gas Rotameter, Oxygen Analyzers, Air Filter Regulator, Oxygen Gas Sensors, Carbon Molecular Sieve, Activated Carbon, Activated Alumina, Desiccant Air Dryers, CO2, H2, N2, O2, Argon Gas Dryers, Refrigerated Air Dryers, Blower Reactivated Type Air Dryer, Bottled (Cylinder) Gas Purifiers, Ammonia Cracking Unit and many more. We have now Sales / Services Offices in Delhi - NCR (Greater Noida), Vapi (Gujarat), Bangalore (Karnataka) And Aurangabad (Maharastra). Enriched with experience PATEL GAS PLANTS has now positioned itself as a respected and reliable equipment and services supplier worldwide.